Dogs love to splash in water specially in summer heat. This bone shaped dog pool looks cute and yet has solid build to last for a long time. 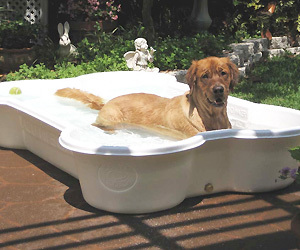 This heavy duty build dog pool can be great hangout place for your per dog to cool off. Besides smaller dogs, it can be easily accommodate large size dogs. If you have multiple dogs, both will love to play and splash together in this pool. It features chew and UV resistant with easy to drain mechanism. With practical drainage system, it remains clean and always ready for your loving dog to start water play anytime. With this placed in backyard, your dog for sure will go in and out multiple times during hot summer day.